Although difficult to tame, Xin’s wicked flames are frightening when handled correctly. 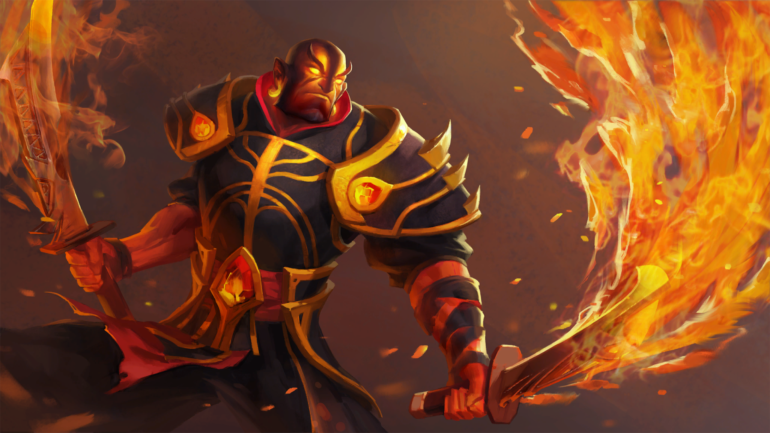 Xin, the Ember Spirit, is a high skill cap, mechanically demanding hero that is often played as either the hard carry or mid laner in a game of Dota 2. His kit makes him both versatile and highly mobile, but he requires a fair amount of game knowledge, game sense, and precise unit control. His signature skill, Sleight of Fist, allows him to deal physical damage to all enemy units in a large area of effect, with each hit taking secondary effects such as critical strikes, cleave, and unique attack modifiers into account. This makes him capable of wiping entire teams that dare clump up together, all in the blink of an eye. He is, however, very fragile—and his stat growth per level is absolutely nothing to write home about. Thus, he requires a strong pair of support heroes helping him with map vision, so that he can use his ultimate Fire Remnant to zip away to safety before getting jumped by heroes with powerful burst damage abilities. When he’s fully mastered, however, he is a force to be reckoned with, able to lock enemy heroes down with Searing Chains while shrugging off a few spells with Flame Guard. If you’re looking for a difficult but highly satisfying hero to pick up, Ember Spirit is a very good choice. The early points into Flame Guard and Searing Chains help immensely in the laning phase. Flame Guard accelerates your farm and makes last hitting a bit easier, while also keeping your opponent at bay thanks to the damage over time it deals in a small radius around you. It scales extremely well with levels, with each invested skill point adding a large amount of damage and a significant increase to its duration. Searing Chains, on the other hand, enables you to lock the opposing hero down to set up for a possible kill with assistance from one of your teammates. While it doesn’t scale as well as Flame Guard, it’s more important to invest early in Searing Chains to ramp up your early and mid game power. Searing Chains is also given priority over Sleight of Fist due to the latter’s poor early game utility. Sleight of Fist relies entirely on Ember Spirit’s inventory to be useful, which makes it better after securing a few key items. The single point at level eight does have its merits though, particularly with the Sleight and Chains combo. We’ll get to that one later. Finally, Fire Remnant is given the least priority after level six, thanks to its abysmal scaling and constant utility at every level. The only thing that investing points into Fire Remnant gets you is a small increase in the magic damage it deals, which is hardly worth it given how vital it is to get the rest of your kit maxed out as soon as possible. Leave Fire Remnant untouched after the first point. 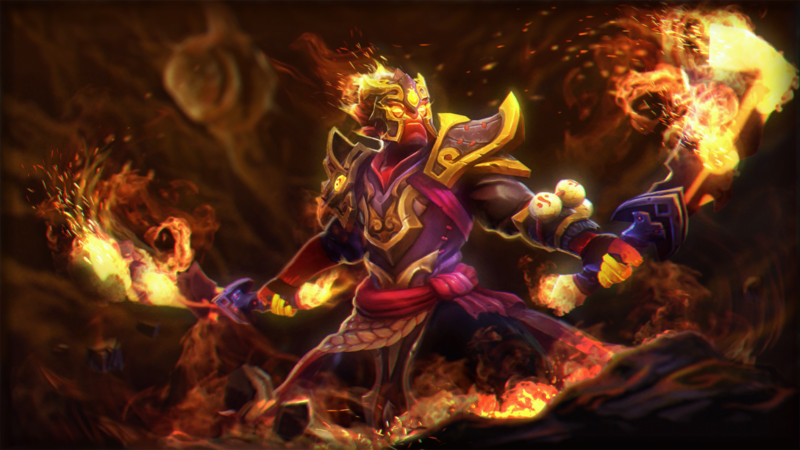 Ember Spirit is a core hero through and through. To leverage his incredible late game burst damage, you must secure a lot of farm through the laning phase and the early stages of the mid game. This is where early points in Flame Guard come into play. A fairly mana cost-effective skill, it greatly accelerates your farm in the laning phase while protecting you from magic-heavy enemy heroes. It does, however, eat into Xin’s small mana pool early on, so it’s imperative that you farm up a Bottle in order to keep yourself topped up in the lane—especially if you’re playing solo mid. As you work your way up to level six, the first item you should buy after Bottle is Boots of Travel. 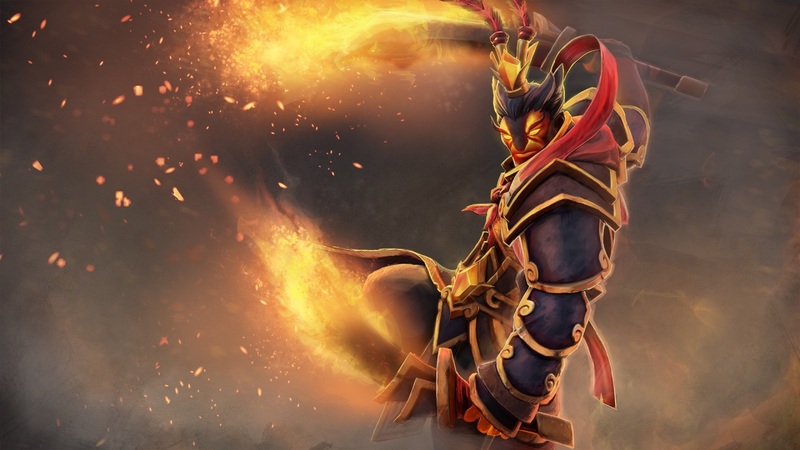 Popularized by pro player Jacky “EternaLEnVy” Mao, the Boots of Travel early game build eschews the Phase Boots route of old in favor of a more globally-threatening Ember Spirit. Combined with the ability to jump to any Fire Remnant on the map, this item helps you farm creep waves with Flame Guard while keeping an escape route handy at the same time. Be sure to abuse this to the fullest, because it also allows you to go home to your fountain in order to refill your Bottle. Later on in the game, you can use it to immediately join your team for ganks as long as there is a friendly creep or tower nearby. Ember Spirit’s item build is fairly straightforward after Boots of Travel. You should first shore up his small mana pool with cost-effective mana regeneration items such as Ring of Aquila and Void Stone/Perseverance. This is because even with the ability to refill at the fountain every time your boots are off cooldown, the choice to go to another lane to continue farming after killing a creep wave (as opposed to going home) should not be undervalued. Perseverance in particular is convenient for Xin, as it also helps him with health regeneration. But the true appeal of this item is that it’s a component of Battle Fury—the one item that Ember Spirit desires the most. Battle Fury works in tandem with Sleight of Fist, which applies secondary auto attack effects to its targets. In this case, it takes into account Battle Fury’s cleave—which can destroy poorly-positioned teams in five-vs-five situations. Opposing teams that are caught standing too close to each other will pay the price dearly, and will be ripped to shreds before they can react accordingly. As added bonuses, Battle Fury keeps Xin’s health and mana pools filled and increases his attack damage. In the case of the latter, any increases to his attack damage carries over to Sleight of Fist. Once Battle Fury is complete, however, his item build diverges into a few different branches depending on the enemy team’s hero composition. 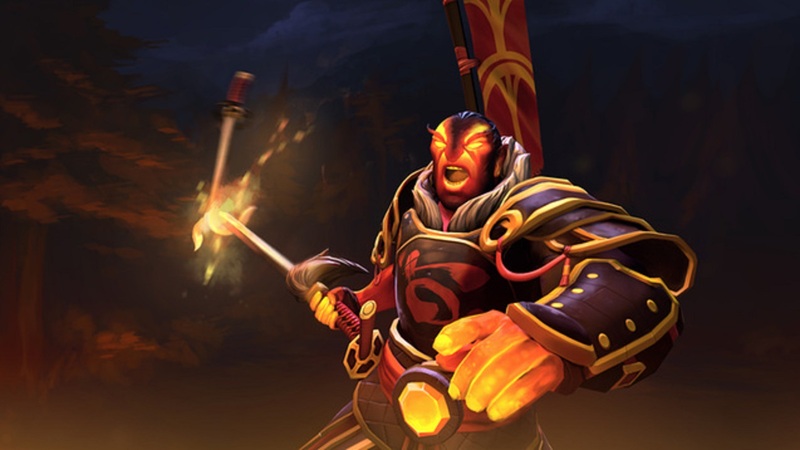 Ember Spirit is severely susceptible to single target, long-duration disables, particularly silence effects such as Night Stalker’s Crippling Fear or the item Orchid Malevolence. When faced with a mass of silence effects, you should choose between either Linken’s Sphere for protection against single target spells, or a Manta Style in order to purge non-targeted silences such as Silencer’s Global Silence or Drow Ranger’s Gust. Manta Style also gives extra stats and movement speed to Xin—both of which are very important to him as a fragile melee hero. Heroes with stun effects that typically purchase Blink Daggers are also problematic. Sven, Earthshaker, and Centaur Warrunner, for example, can quickly get in your face and lock you down before you can jump to your Fire Remnant. Aside from playing carefully and (politely!) asking your supports to ward common ganking paths, you can opt to purchase a Black King Bar for extra safety against these heroes. The rest of the item is garbage for its gold and inventory slot costs though, so think twice before building a BKB. Above all else, don’t get too greedy by rushing into damage items after Battle Fury, unless you have a significant draft advantage. Strong mid game heroes with potent disables can easily ruin your momentum, especially in pubs where team coordination isn’t particularly good. From there, you can either go the pure physical damage route or the increased utility route. For the former, Daedalus is the item of choice. Since Ember Spirit can’t really go toe-to-toe with traditional “stand and fight” type carries, Daedalus helps him even the playing field by hitting with critical strikes from a distance. With the right positioning and luck, you could even decapitate several heroes in the blink of an eye. For the latter, we recommend Eye of Skadi for the huge stat bonuses it gives, and the fact that it allows you to kite heroes that would otherwise beat you one-vs-one thanks to Frost Attack. Keep in mind that Frost Attack goes through spell immunity, which makes it useful against BKB-wielding heroes. Mjollnir is particularly effective against illusion-heavy drafts. Not only does the passive tear through enemy illusions, but Mjollnir’s active ability discourages heroes like Phantom Lancer and Naga Siren from simply running up and right-clicking you. Mjollnir also helps greatly when your team’s back is up against the wall, especially against Mega Creeps. 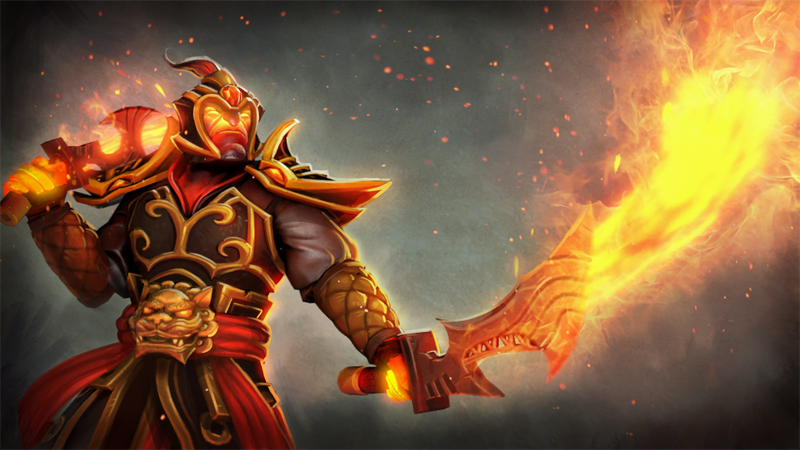 Divine Rapier can be purchased as a last resort damage booster, or something to help close out a particularly long game that is in your team’s advantage. 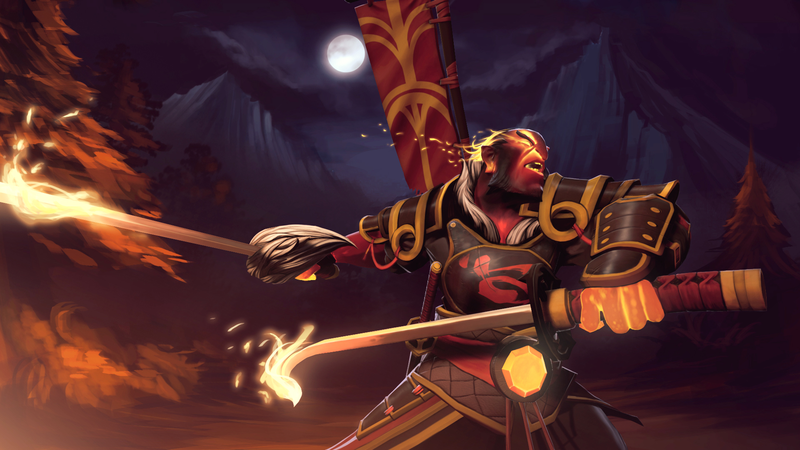 Ember Spirit is one of the best Rapier carriers in the game not only due to Sleight of Fist, but also thanks to his natural mobility and hard to kill nature. Ember Spirit’s gameplay relies on getting a few skill combos down pat. The first and arguably most important one is the Sleight of Fist into Searing Chains combo, which involves casting Sleight where your target is and quickly activating Chains during the Sleight animation. If done correctly (or with luck on your side, in the case of executing the combo with a creep wave in the area), this will cause the chains to hold your target in place. The Sleight/Chains combo in action. This works because the game puts Xin’s position on the map according to which target Sleight of Fist is currently hitting, and because you can cast spells and use items during the animation. This combo does, however, take a bit of practice and muscle memory, so make sure to practice beforehand in order to get the speed at which you need to hit the appropriate keys. From there, you can run up to any rooted heroes with Flame Guard to deal extra damage, and to protect yourself from retaliatory nukes. Finish wounded heroes off with either right-click attacks or additional uses of Sleight. Once mastered, the Sleight/Chains combo will allow you to skip buying a Blink Dagger, since you can initiate from a decent range with some consistency without it. The combo also allows you to initiate without the use of an aggressively-placed Fire Remnant, giving you an emergency escape route should a gank or teamfight go wrong. Note that you can jump to any active Fire Remnant during Sleight of Fist. This is especially useful in situations you need to react to, such as when all of the enemy heroes suddenly show up to gank you. Use Sleight on either the heroes or a nearby creep wave, then jump to a Remnant while you have Sleight’s invulnerability buff. In late-game situations such as high ground sieges, make sure to take full advantage of Ember Spirit’s reach. Sleight of Fist is quite spammable thanks to its low mana cost and cooldown, and works even when you don’t have high ground vision. This makes it perfect for dealing chip damage to enemy heroes defending a tier three tower, forcing them to either use a Shrine, go back to the fountain for healing, or get initiated on with half their health gone. As mentioned previously, though, Xin is not designed to win prolonged teamfights against carries with high sustained DPS. He is not Anti-Mage, Phantom Assassin, or Juggernaut. Avoid being in the frontlines for too long unless you have a sizable advantage in the clash already. Keep your distance from the enemy team, weaving in and out as Sleight of Fist comes off cooldown. Leave Remnants behind before committing to engagements, in case you need to jump out at any time. If you decide to learn how to play Xin, be aware that the road to mastery will be quite the journey. Although he has a pretty reliable escape mechanism in Fire Remnant, his margin for error is very slim. Silences, in particular, practically remove him from the game, and his poor stat growth per level means that he stays squishy for a long time. There’s also an alternate item and talent build for Ember Spirit, that involves leveraging his spell damage amplification talent at level 10. This is a slightly more advanced route that’s worth considering depending on your team’s hero composition and the draft you’re going up against. But since it requires being more active in the mid game—thus requiring more coordination with your teammates as well—we don’t recommend it for first time users. Don’t feel discouraged if you lose your first couple Ember Spirit games. The hero truly requires a decent amount of practice and game sense in order to excel. But of course, nothing good ever comes easy—and when you’re ripping the enemy team to pieces, we’re sure you’ll see that training with Xin does reward you handsomely.